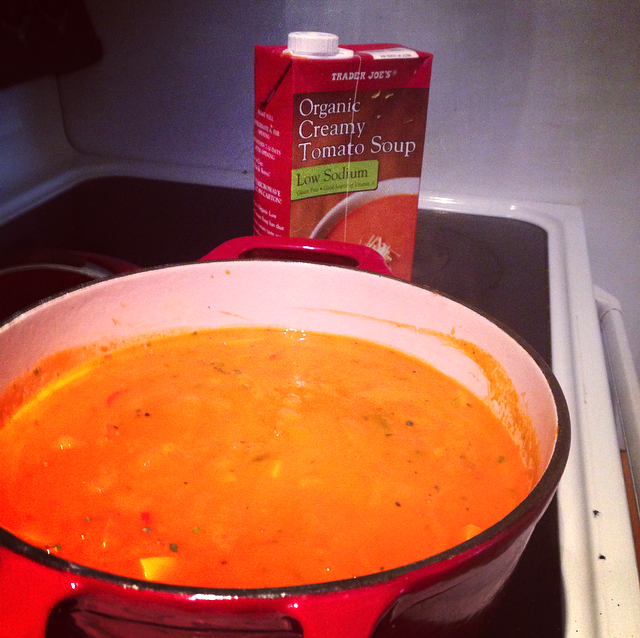 If it hasn’t become clear how obsessed I am with Trader Joe’s Tomato soup, i’m not sure how else I can drive it home! 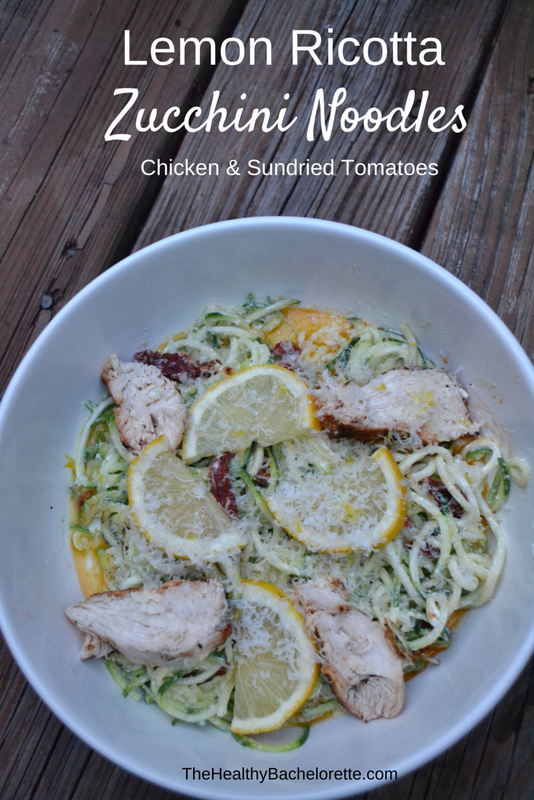 It really is incredibly delicious, low calorie, low sodium, and very flavorful. Per usual, i’ve stuffed this soup with plenty of healthy ingredients so you can get the most bang for your bowl of soup. Enjoy! 1. Heat a pot on the stove on low-medium heat with olive oil. Sweat the onion and garlic, covered, for 3-5 minutes until onions turns clear. 2. 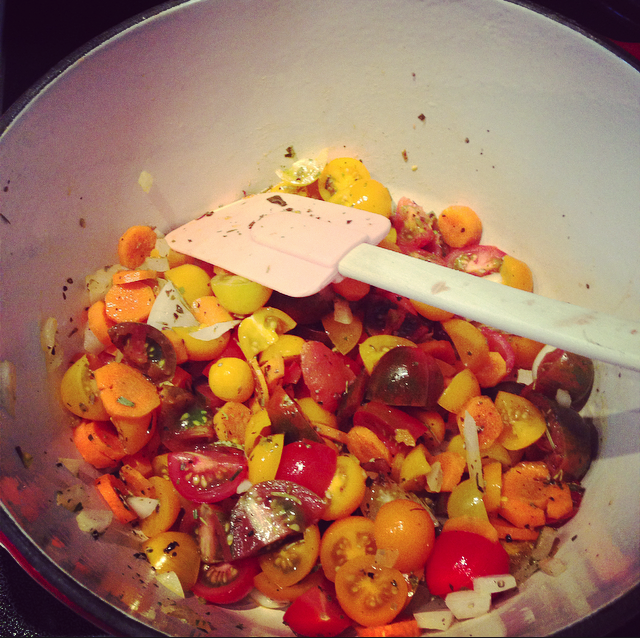 Next, stir in the tomatoes and herbs and cover. Let cook for another 3-5 minutes. 3. 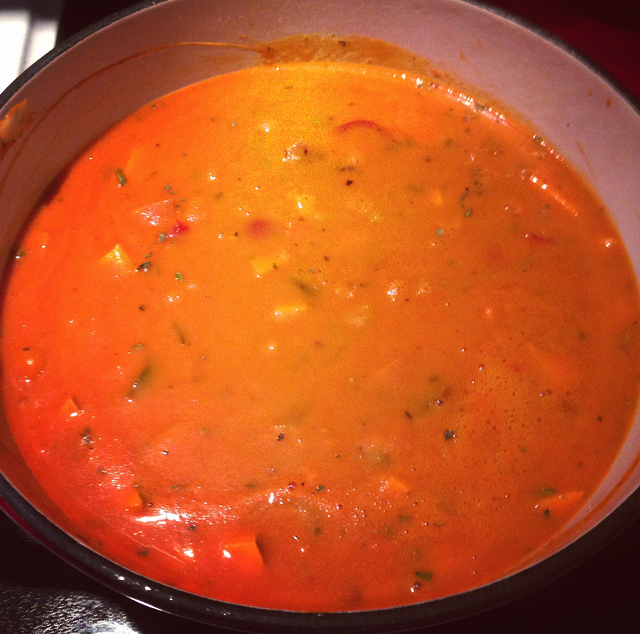 Pour in your tomato based soup and 1 cup of water/chicken stock. Let soup come to a light simmer (slow, small bubbles at the top), then add in your barley. Let simmer for about 10 minutes if you are using quick cooking, or 25 minutes if using regular barley. 4. 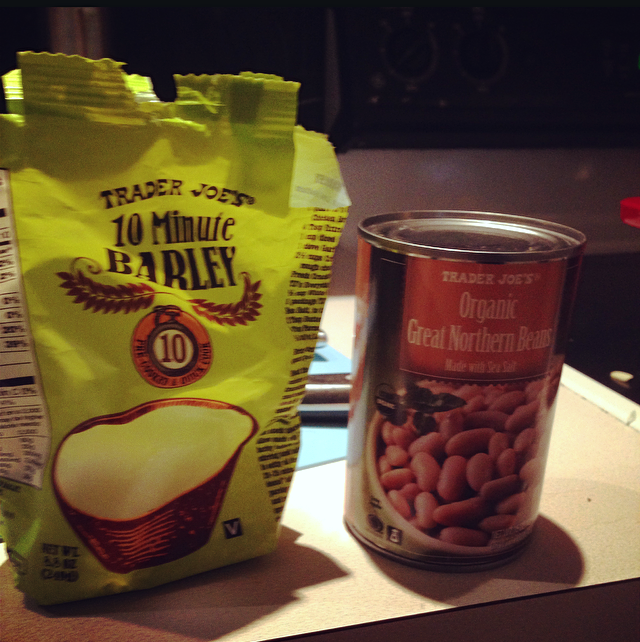 Once your barley is fully cooked, add in the white beans, fresh ground pepper, basil and stir! 5. 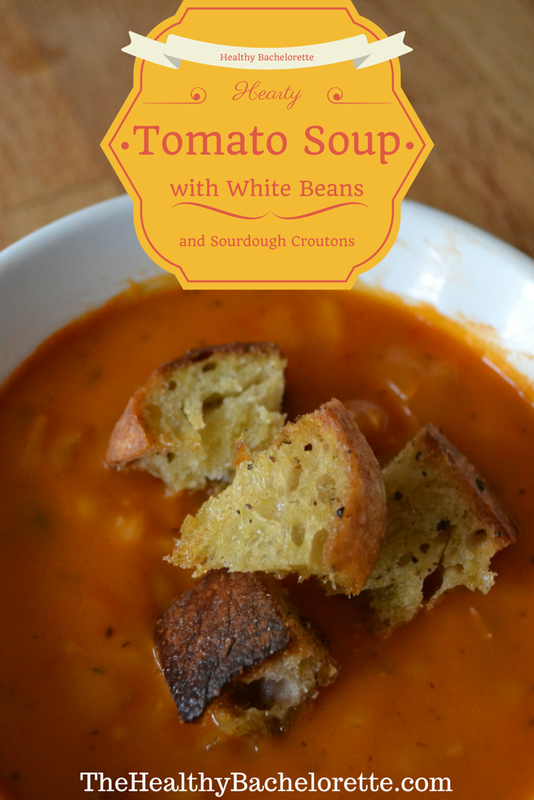 Serve with sourdough croutons (recipe below), and enjoy! Toss the sourdough bread pieces, olive oil, black pepper and garlic powder in a mixing bowl until evenly coated. Bake for 7-10 minutes on 350 degrees in a traditional or toaster oven. 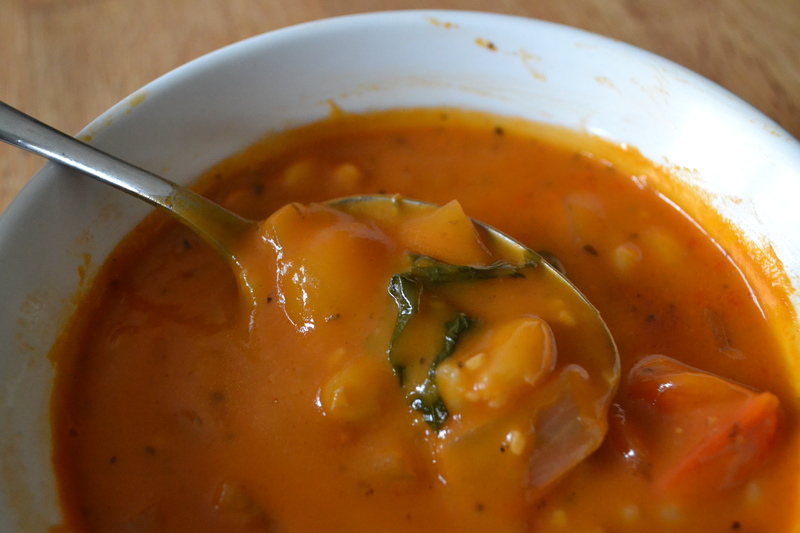 Place on top of The Healthy Bachelorette Hearty Tomato and White Bean Soup! 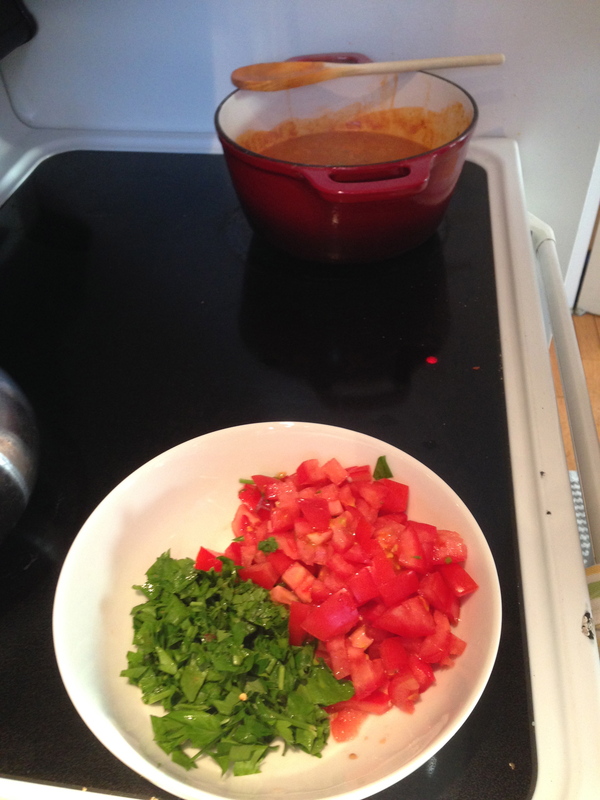 This sauce is absolutely delicious and one of those meals requiring minimal effort and pans. Regretfully, I did not take any other pictures than the one below but luckily it gives you a good idea of how it looks! It is basically a super chunky and flavorful tomato sauce. I have also used this as a topping on baked chicken, pork and sautéed shrimp! Enjoy! 1. Heat olive oil in a sauté pan or dutch oven of your choice on medium heat. Stir in garlic and onion and sauté for 2-3 minutes, covered. 2. Next, toss in your 3 cups of diced tomatoes and eggplant. Make sure you chop these in bite size pieces for easier cooking! 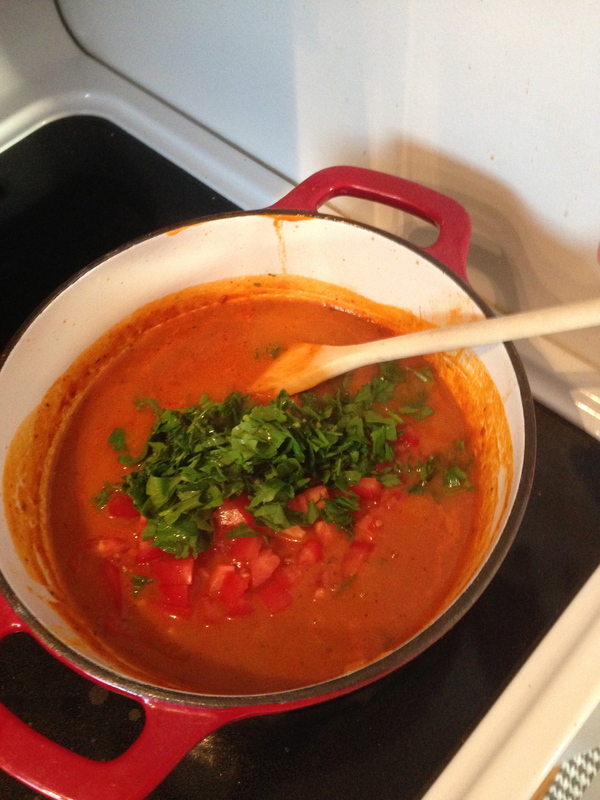 Continue to pour in your tomato based soup, you can always add more to your preference. Add in your herbs de provence and red pepper. 3. Let this simmer on low-medium heat, covered, for approximately 25 minutes. 4. Serve over your favorite pasta with parmesan cheese and fresh parsley! Try it on top of baked pork or chicken or even sautéed shrimp! This type of soup is perfect for a chilly fall evening. When you’re looking for something tasty and comforting without loading on the kcal’s. 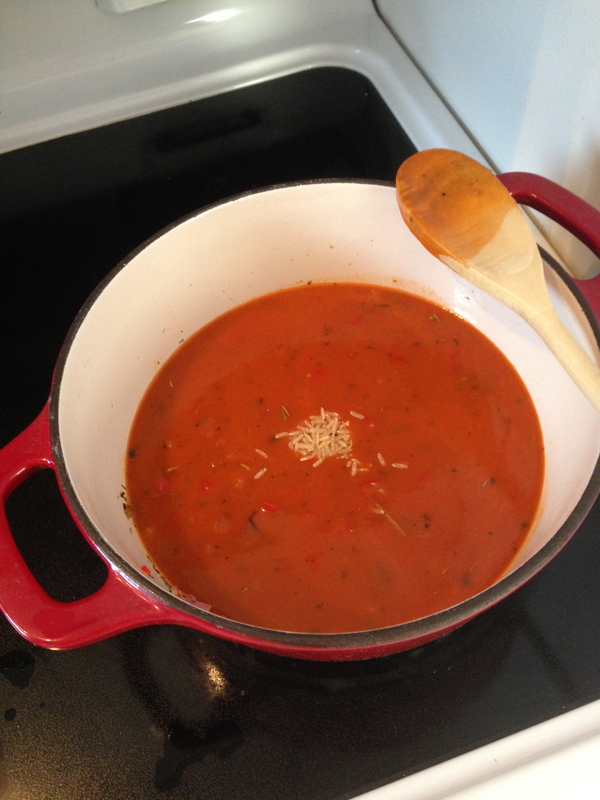 This is easily made with a variety of veggies, tomato based soup, chicken stock, and brown rice and it cooks in 30 minutes! I topped it with some leftover chicken breast I had, however, in the past I have also poached an egg in it before- also tastes great as is! I used low sodium tomato based soup and chicken stock and I added in some extra fresh veggies right at the end for added texture, fiber, and flavor, YUM! This tastes even better for lunch the next day! 1. Heat olive oil in a pot on low-medium heat. 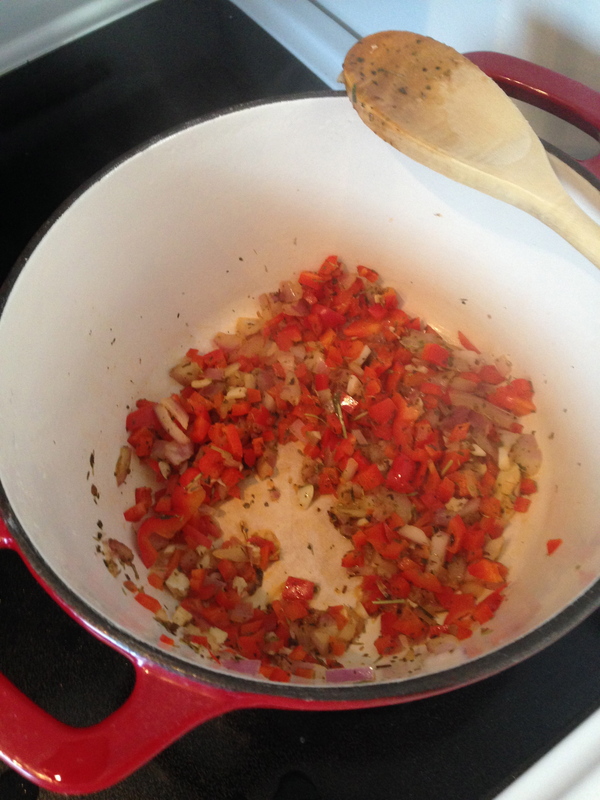 Chop your onion, garlic, and red pepper and add into the pot along with your herbs de provence. Cover and sweat the ingredients for 2-3 minutes. 2. Pour in the tomato based soup and chicken stock. Let it simmer for about 5 minutes. 3. Add in the 1/2 cup of brown rice to the pot. Cover and simmer for 20 minutes until brown rice is cooked through. 4. 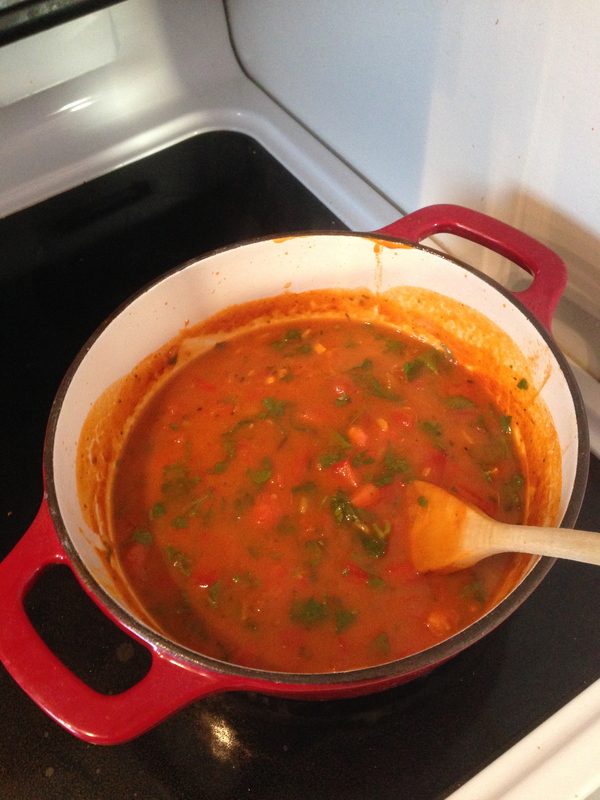 Lastly, add in the fresh tomatoes and parsley, stir together. 5. Serve with fresh ground pepper and parmesan cheese! 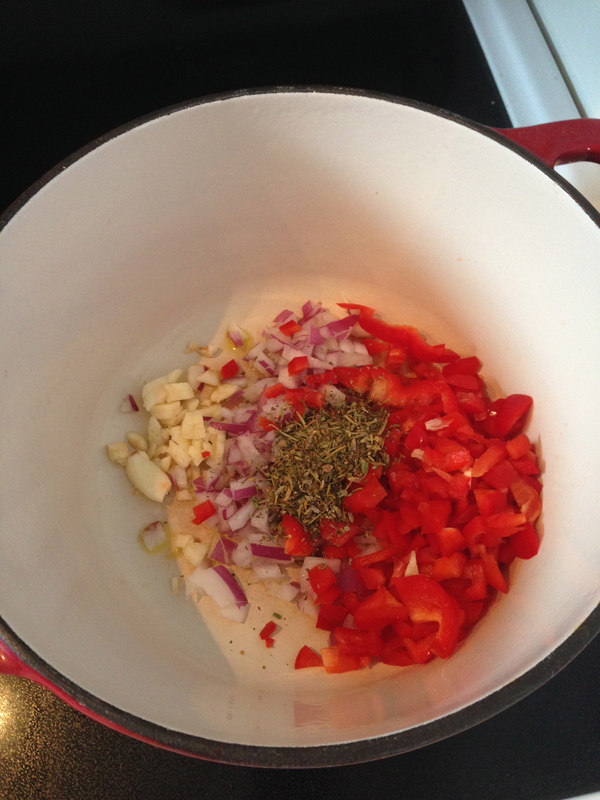 Garlic, onion, red pepper, and herbs de provence! Sweating the veg on low- med heat makes them more aromatic and impart more natural flavor into your dish! 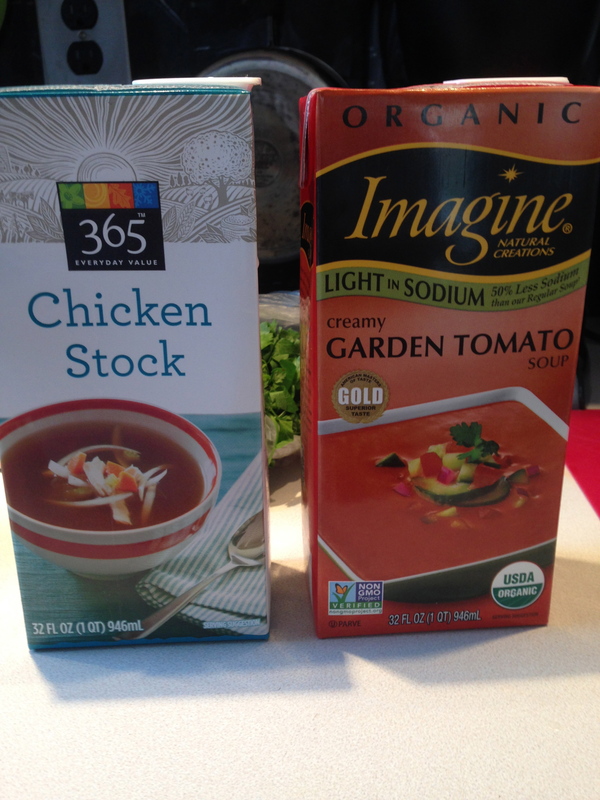 Good examples of stock and tomato base soup to use! Simmering soup, brown rice going in!